¡Hola, hola bombones! ¿Qué tal lleváis el último martes del mes de agosto? 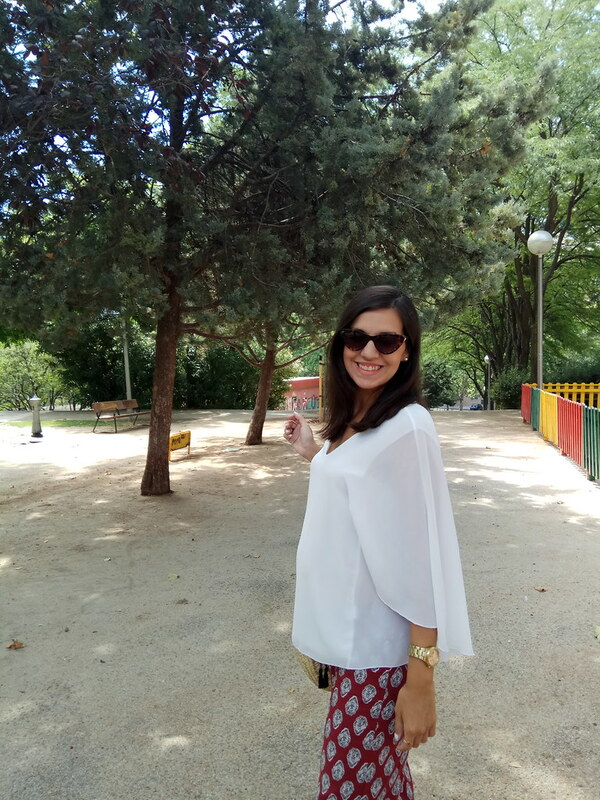 Yo la verdad es que con mucha pena, porque se me está pasando el verano casi que sin darme cuenta. 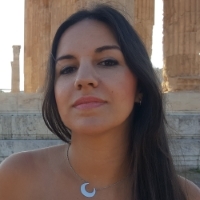 Y es que tengo sentimientos encontrados por un lado con que llegue ya el mes de diciembre para ver por primera vez a mi bebé, pero por otro lado con que se pare el tiempo y poder disfrutar al máximo de mi barriguita (si hay alguna mami que me lea, me entenderá). Hoy, precisamente estamos ya de 24 semanas y he querido mostraros otro look algo diferente del habitual con pantalón ancho. 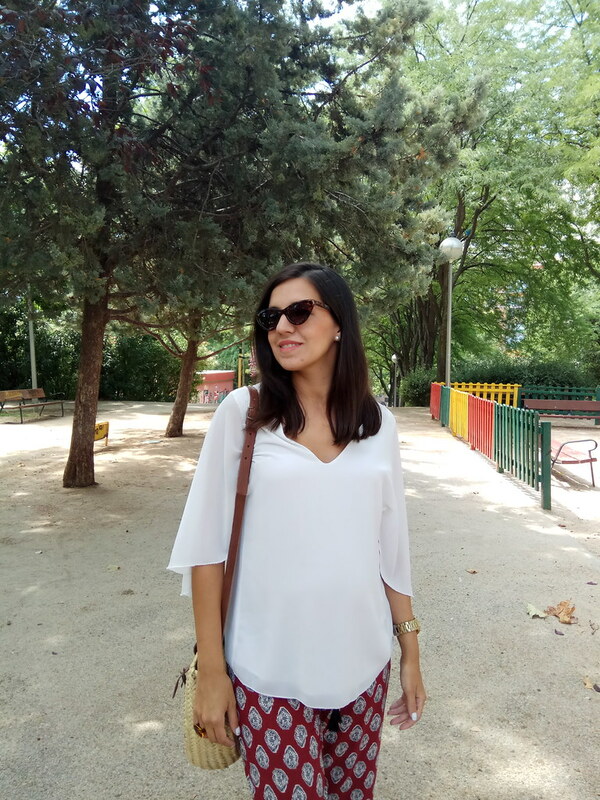 Me gusta porque es un look versátil para ir a cualquier sitio, sólo cambiando los complementos y zapatos con los que los que los combines, y también miré que luego me sirve para cuando suelte la tripa…(una tiene que ser práctica). 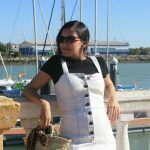 La verdad, es que he usado menos este tipo de pantalones durante la temporada, porque suelo estar incómoda con algunos, pero éste que os muestro es súper cómodo, ya que su cintura es ajustable con cordones y no aprieta. 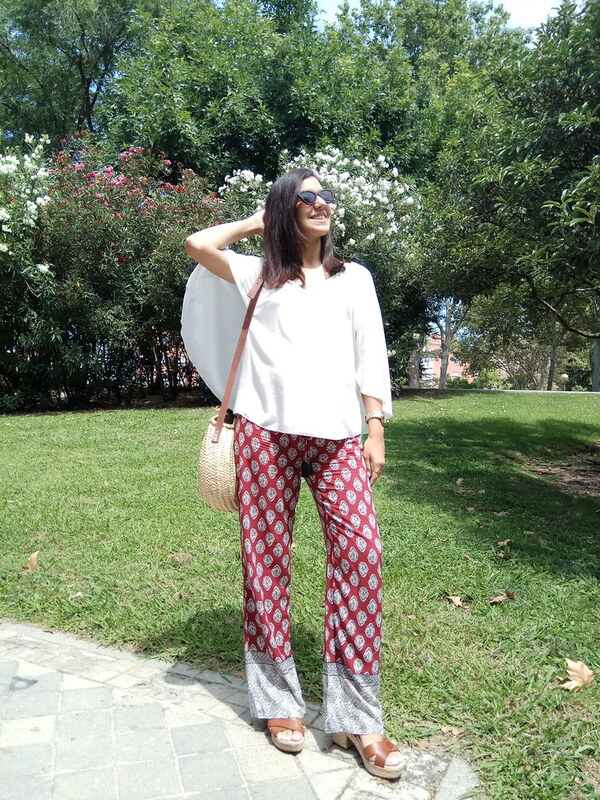 Es largo, de pierna ancha y con un estampado étnico, que lo convierte en un print ideal para primavera-verano. 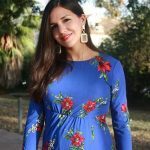 Es de Women’s Secret y ahora podéis encontrarlo en tienda de rebajas, así que ¡no tenéis excusa para ir guapas por poco dinero! 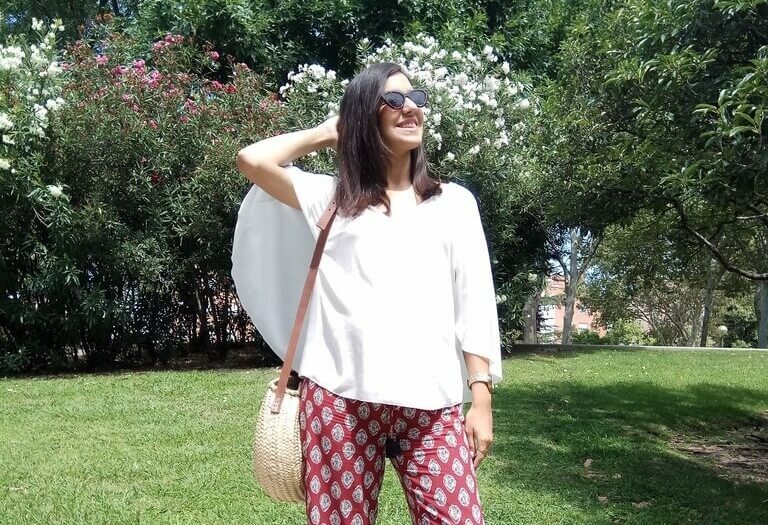 En mi caso, lo he combinado con una blusa de gasa de color blanco, que le hace así contraste al estampado del pantalón ancho, bolso cesta de mimbre y sandalias color cuero. 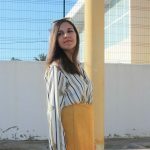 Espero que os guste el outfit de hoy y que me dejéis algunas ideas vuestras con otras posibles combinaciones con pantalón. Hello, hello bonbons …! How are you doing on the last Tuesday of the month of August? The truth is that I’m really sorry, because the summer is almost happening without realizing it. And I have mixed feelings on the one hand with the arrival of the month of December to see my baby for the first time, but on the other hand with that stop the time and be able to fully enjoy my tummy (if there is a mom that read me, you will understand me). 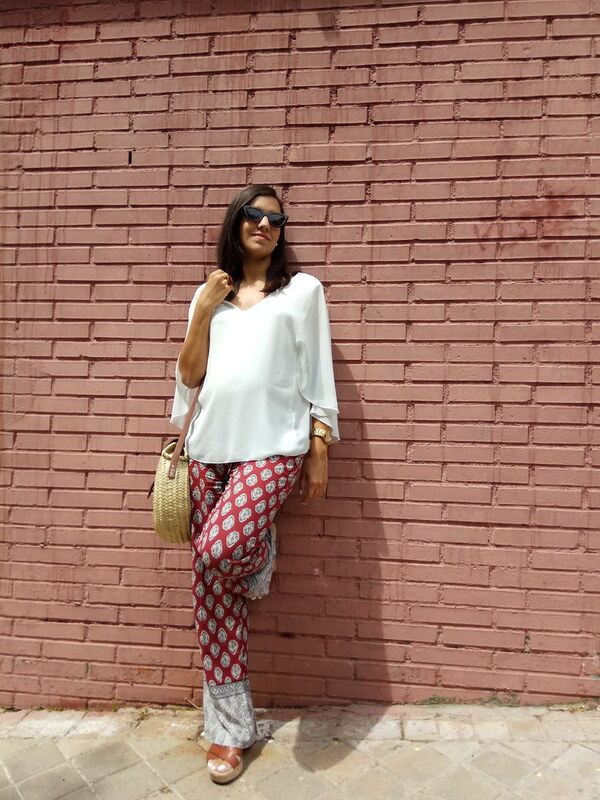 Today, we are just 24 weeks and I wanted to show you another look something different from usual with wide pants. I like it because it is a versatile look to go anywhere, just by changing the accessories and shoes with which you combine them, and I also saw that it then serves me when I release the gut … (one has to be practical). 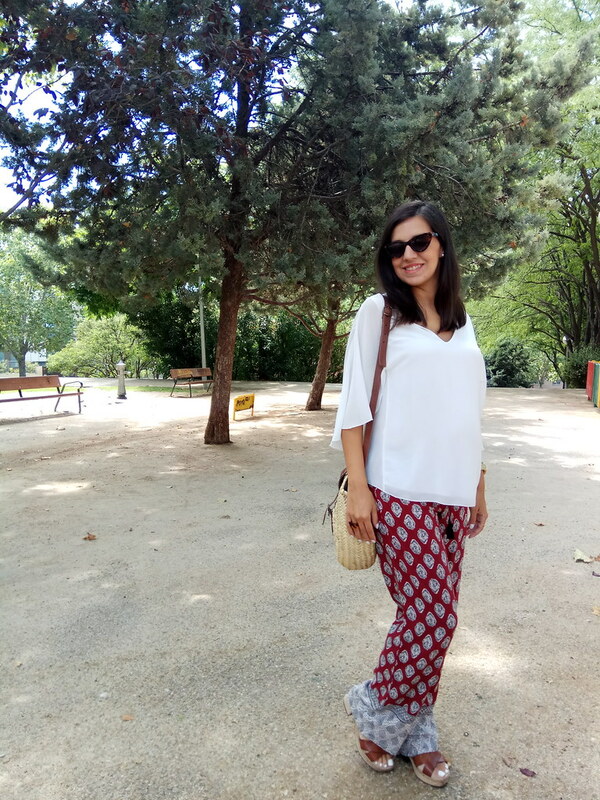 The truth is that I have used less this type of pants during the season, because I tend to be uncomfortable with some, but this one I show you is super comfortable, since your waist is adjustable with laces and does not tighten. 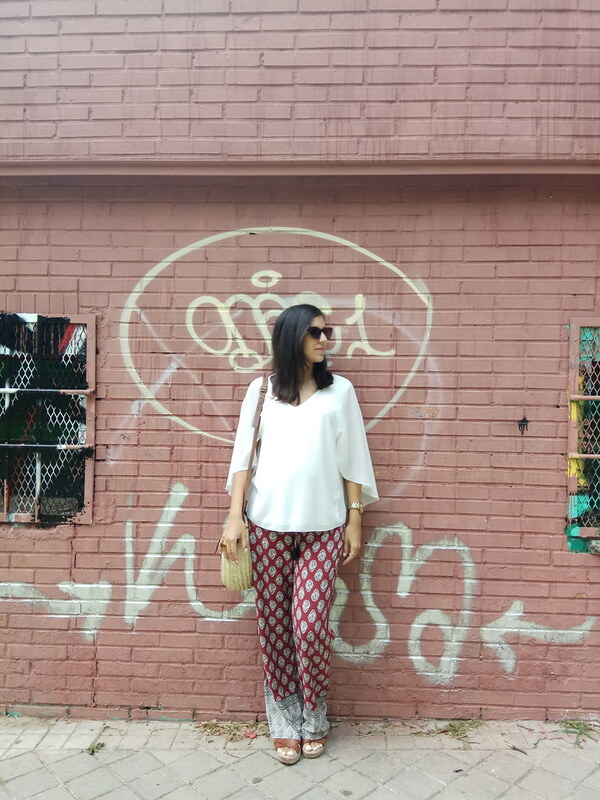 It is long, wide leg and with an ethnic print, which makes it an ideal print for spring-summer. It’s from Women’s Secret and now you can find it in a sales store, so you have no excuse to go beautiful for little money! 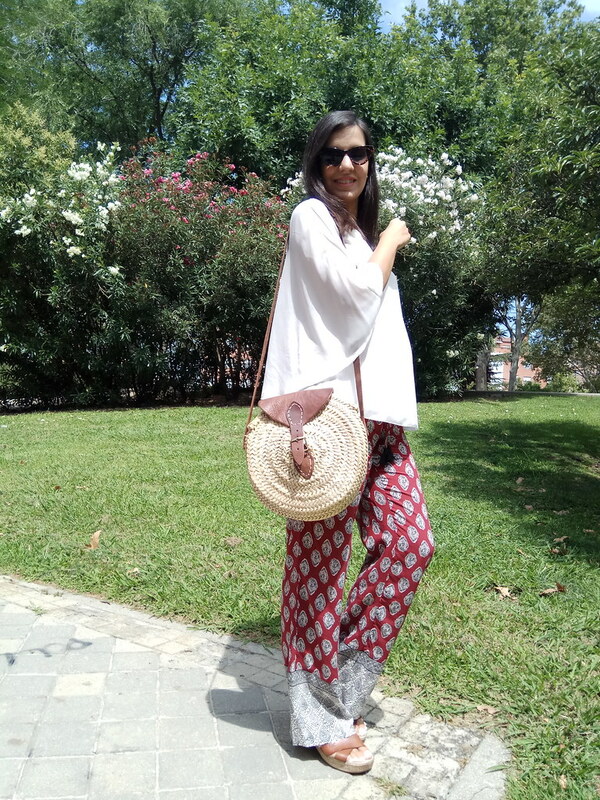 In my case, I have combined it with a white chiffon blouse, which makes it contrast to the print of the wide trousers, wicker basket bag and leather sandals. I hope you like the outfit of today and that you leave me some ideas of yours with other possible combinations with pants.